The BBC has run 4-day trips to Downeast Maine around July 4th for many years. 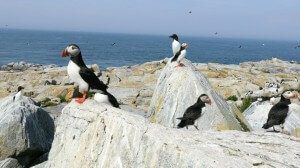 The main attraction is an opportunity to land on Machias Seal Island for up close and personal looks at Atlantic puffins and other seabirds that nest on the island. The trip is not limited to offshore birding, however, and other days are dedicated to inland birding looking for boreal species like Spruce Grouse and Black-backed Woodpecker. This year was our third trip north with the group. The group meets at Gilsland Audubon Sanctuary early the first day where they were treated to looks at Little Egret and then proceeded north for Purple Martin and Black Tern at Lake Messalonskee. 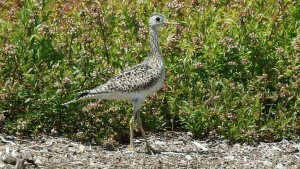 We skipped these stops this year as the fields at Gilsland are too much for my hayfever, and met the group at their lunch stop in Eddington, ME before proceeding farther north for Upland Sandpiper in the blueberry barrens of Dublois. The day culminated with arriving at the Bluebird Motel in Machias and later dinner with the group. There are few places for dinner in Machias that accomodate groups of 15-20 but we found Helen’s to be our preferred establishment. Day two starts early with a longish drive inland to Topsfield for boreal species. 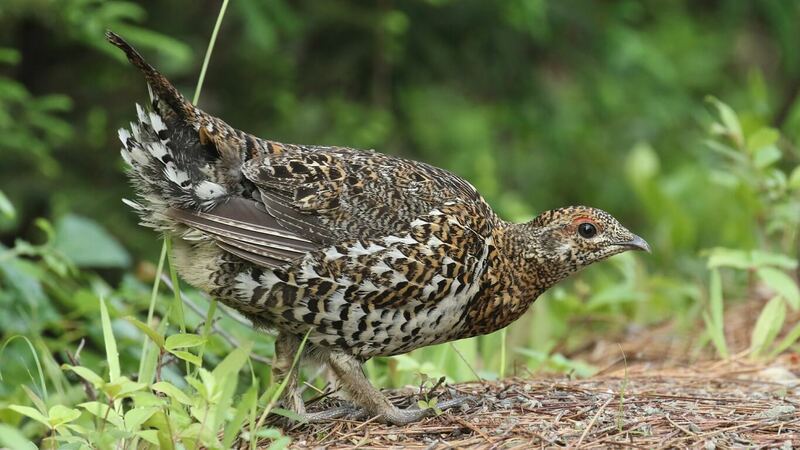 Spruce Grouse has been the most reliable on our trips, but the area is also filled with Black-throated Green, Magnolia, Canada, and Black-and-White Warblers, to name a few, and Yellow-bellied and Olive-sided Flycatchers. We’ve also found Boreal Chickadee, Gray Jay and Black-backed Woodpecker in the past, but these have been more difficult to see the last couple years. in flower and habitat specializing butterflies like the bog copper. Fields contain numerous butterfly species, some of which are uncommon in Massachusetts, like the colorful Harris’ checkerspot. We’ve seen moose, snowshoe hare and successfully avoided the black bears. 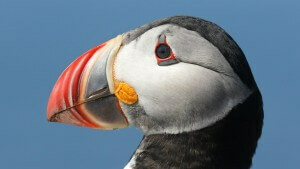 This year day 3 was puffin day. Historically the first week of July has provided an excellent chance of landing on the island and this year was no exception. Access to the island is limited to 30 visitors a day with permits divided between a Canadian tour boat and our US-based tour boat run by Bold Coast Charter. The trip takes about an hour to make the 10 mile or so journey. 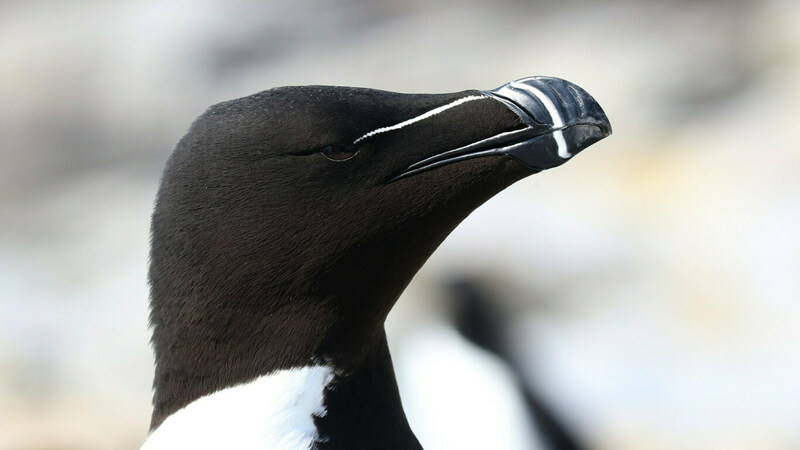 Early July is chick rearing season with Puffins, Razorbills, Common Murres and Arctic Terns all bringing fish home for the myriad hungry mouths back on the island. We spent about an hour in the blinds. During this time Puffins and Razorbills are all around us. We hear them flying in and landing on our roof and the thump, thump, thump as they toddle across the top of the blind. We see them walking up to the windows and looking in at the strange caged primates brought in for daily entertainment. At times they are so close we could reach out and touch them – highly unrecommended if you value your fingers. When not in the blinds, we sat out on the patio and watched the terns feeding their chicks on the lawn a few feet away. On a patio the terns left us alone, but if we left the patio we carried sticks above our heads to avoid getting dive bombed as they protected their nestlings. That afternoon we went to West Quoddy State Park. West Quoddy offers more opportunities for boreal birds, although what we found was mostly more warblers like the Black-throated Green, who seem to have their own song dialect here. There’s also a nice crowberry bog with a variety of specialized flora including carnivorous species, like pitcher plants and sundews. We also got a flyby from a crowberry blue butterfly. It’s a crowberry bog specialist only found in a few Downeast locations. That evening we supped in Lubec, perhaps one of most scenic spots Downeast. Our last day we birded various local spots along the coast beginning with a short stop on the Sunrise trail in Machias with good looks at Nelson’s Sparrow, found a Hermit Thrush collecting food on Birch Point Road, and walked trails in Roque Bluffs State Park. We finished the day at Great Waas Island Preserve one of many scenic locations along Maine’s rocky coast. For those with some extra free time, Campobello Island, known for the Roosevelt family compound, is just across the channel. Farther out Passamaquoddy Bay is the scenic Head Harbor Lightstation which can only be reached at low tide. Generally the tides in the region run 14-16 feet and can quickly turn the lighthouse into its own little island. 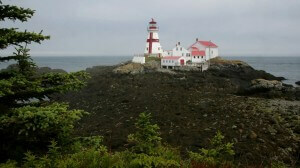 Remember to bring your passport if you want to visit Campobello,as it’s in New Brunswick, Canada. The BBC Downeast trip is a great introduction to birding in the region as well as a welcome opportunity to escape Boston summer heat. Anyone looking for a holiday weekend getaway should consider the trip Downeast to see the puffin colony up close and personal. A special thanks to Ida Giriunas and Dave Ely who’ve organized the these trips for many years.